I’m back, after taking several months off. And what do I come back with after all that time– recipes for creative things to do with your Thanksgiving leftovers, like most food blogs will do this time of year? No, I have to be different. 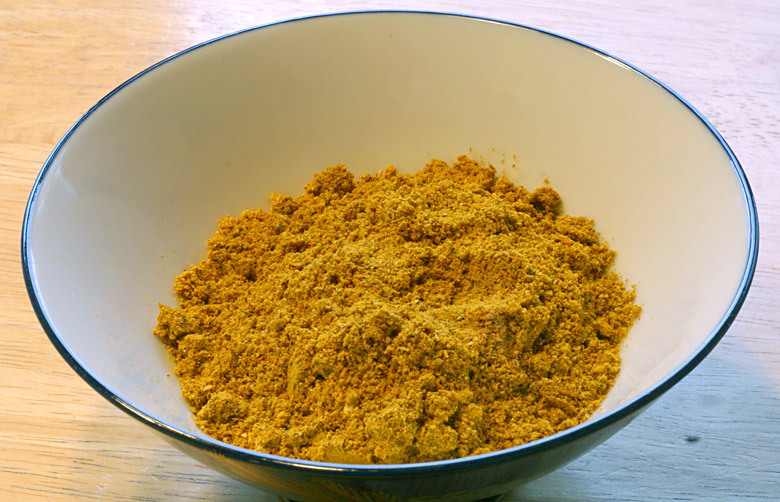 Why a curry powder recipe post on Thanksgiving weekend? It is actually related to Thanksgiving leftovers: We go to Kristina’s parents for Thanksgiving, so my only experience with cooking turkeys so far is smoking a whole turkey. But we get plenty of turkey leftovers to take home, so I used the bones to make a big batch of turkey stock, and then I used some of the stock and turkey meat to make this Curried Turkey Soup Recipe from Simply Recipes, which was really good. Why go to all the trouble of making your own curry powder, when you can just buy it ready-made anywhere? And why do I keep asking and answering my own questions in this post? 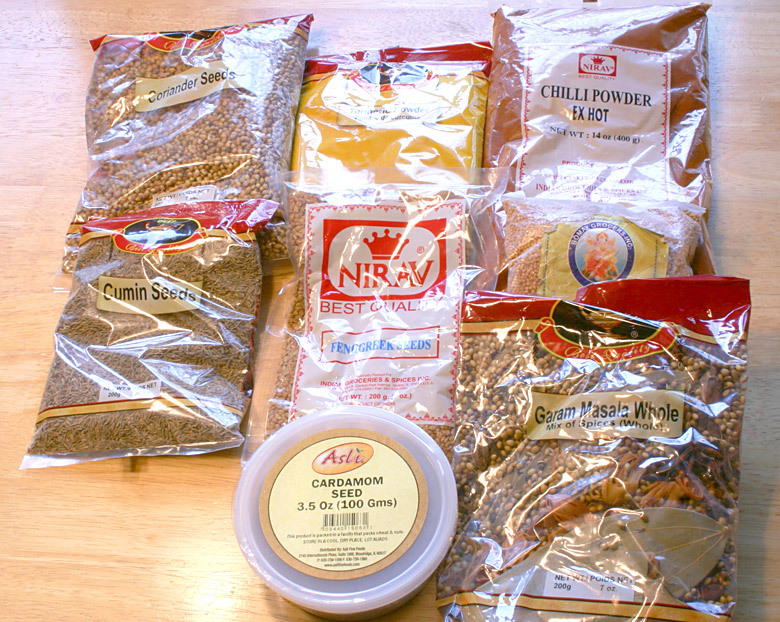 Well, there’s a couple reasons why it’s nice to make your own curry powder from scratch. And it’s really not all that much trouble. First, you start with spices in their whole, unground form, and unground spices will stay fresh a lot longer than when they’re purchased pre-ground. 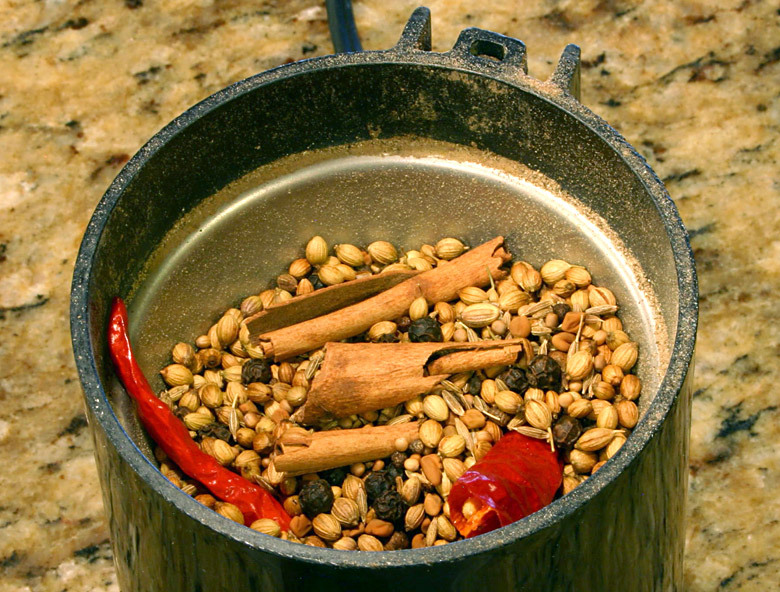 So your curry powder, made in small fresh-ground batches, will be at the peak of flavor. Also, you can adjust things to suit your taste. The mad scientist in me likes experimenting with amounts and types of ingredients to fine-tune what I like best. Although I’m using my curry powder to try a recipe from the great Simply Recipes site this time, I’ll use this curry powder in my own chicken or lamb curry recipe in an upcoming post. Measure out the spices. Now, the plan is to start with as many spices in their whole form as possible, so they can be ground up fresh. But you may not have everything in whole form on hand. In the picture below the only ingredients I started with in powder form are turmeric and ginger, because these related vegetables come in root form, not seeds, like many of the other ingredients. So it’s easier to buy these in pre-dried and pre-powdered form. Also, I didn’t have whole cloves, and whole dried cloves don’t grind up easily, so I used powdered cloves. You may not have whole dried red chilies or whole cinnamon sticks, so it’s perfectly fine to use chili powder or ground cinnamon instead. 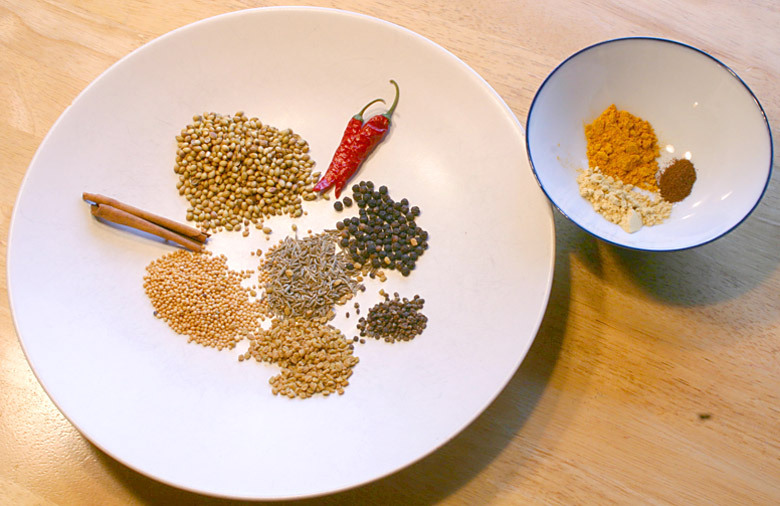 The spices that are best to start out with whole are the dried seeds– cumin. 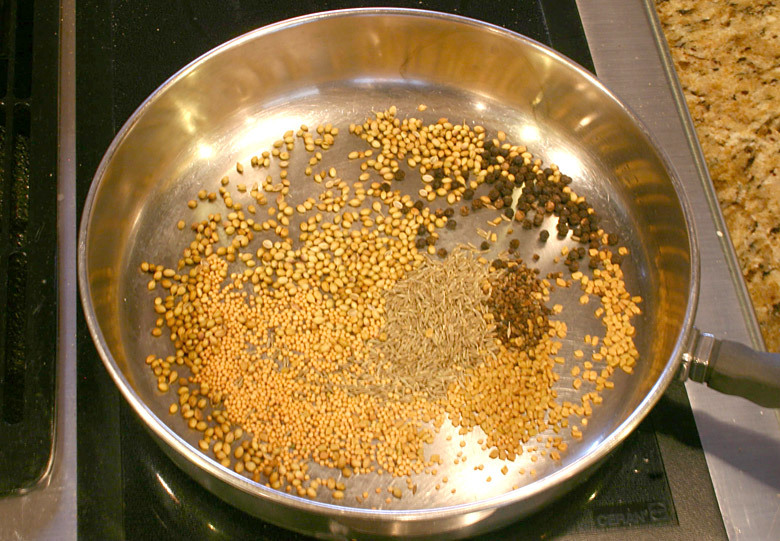 coriander, fenugreek, cardamom, mustard, and black pepper– because we’re going to further bring out the flavor of these by toasting them before we grind them up. This recipe makes about a 1/2 cup of curry powder, which (depending on how curried you like your curries) will probably be good for two meals. The unused curry powder will stay fresh in a sealed container for a few weeks. enjoy!